Washwow 2.0 - Travel Laundry Made Easy By Using Water Electrolysis! Ever wondered if you could wash clothes without detergents? [Psst… remember our review on Nival Portable washer?] Or you find the title amusing and funny? Believe it or not, it’s now possible. And we would now tell you how it was made possible, with the help of a very basic concept of Chemistry. Washwow 2.0 is a nifty gadget that enables you to wash clothes without detergents. 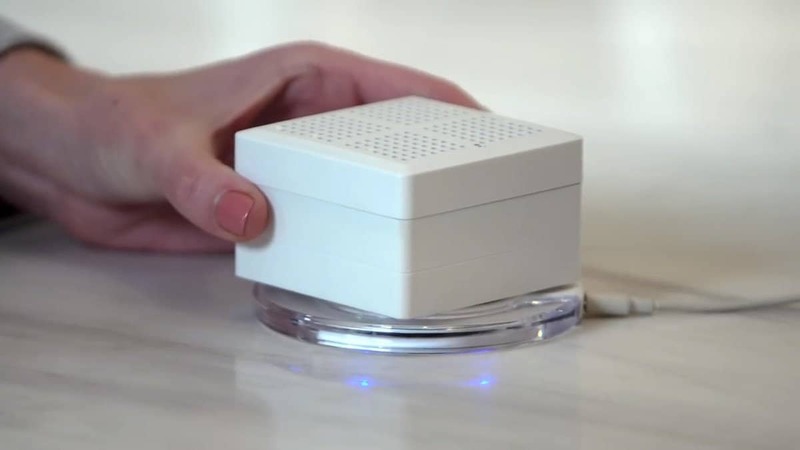 Washswow uses Electrolysis of water, and the next-gen Washwow 2.0 is just a small cube equipped with wireless charging so that there are no electrical hazards while using it. It can remove organic stains, bacteria, and dirt. Due to the water electrolysis, there is no harm to clothes and in clinical tests, it was observed that it can clean up to disinfect clothes from bacteria up to a rate of 99.98%. As no detergents or chemicals are used to clean clothes and runs on electricity, it is eco-friendly and safe. The Washwow 2.0 looks like a soap and weighs just 265 grams, it uses the reactive oxygen species which generated by the electrolysis of water to decompose the dirt on your clothes. Noble metal inside the cube can create positive and negative electrodes and OH, O, O2, O3, On, HnOn can decompose the organic dirt while the hypochlorous acid acts on the bacterial formation. To use the Washwow 2.0, it needs to be charged for 6-8 hours and after one full charge, it can be used for up to 2 hours (approx.). That’s not all, it can also remove residues from fruits and vegetables within five minutes. The Washwow 2.0 supports QI Standard Wireless Charging and also supports charging via USB. However, it is recommended to charge the cube wirelessly in cleaning area due to the presence of water. As of now, the Washwow 2.0 is being promoted as a Kickstarted Campaign and as a Super Early Bird, you can grab this tiny but useful gadget for as low as $89.